Cichlids add brilliant color to freshwater aquariums at a fraction of the cost of saltwater fish. Most of the 1,400 species of cichlids are hardy, allowing the new aquarist a little leeway while perfecting his fish routine. Cichlids swim near the bottom for a variety of reasons, most of which are normal behavior. Some cichlid varieties have smaller swim bladders, making them less buoyant, such as steatocranus casuarius -- or lionhead -- which adapted to its natural environment in swift rivers by staying in slower water along the bottom. This hardy species is a good choice for first-time cichlid owners and is amusing to watch moving in jumping motions along the bottom of the tank. Another breed, nimbochromis livingstonii, feigns death to lure fry within reach of its hungry jaws. Cichlids creating a nest will burrow into the gravel under a rock or decoration. Fish will either lay eggs in the nest or the female will hold them in her mouth. The mother fish commonly hovers at the nest site with dad swimming nearby to help protect newly hatched fry from other cichlids in the tank. A female fish brooding eggs or fry in her mouth will not eat and remain hidden in the nest during feeding time. Cichlids are more territorial when there are less fish in the tank and may hang out at the bottom to defend a favorite part of a grotto rock. Most cichlids instinctively feel secure in a rocky biotope and will try to remain hidden along the bottom if your aquarium only contains plants. Cichlids feel most secure in near-crowded conditions, so plan your tank to provide adequate filtration and rock formations for plenty of fish. 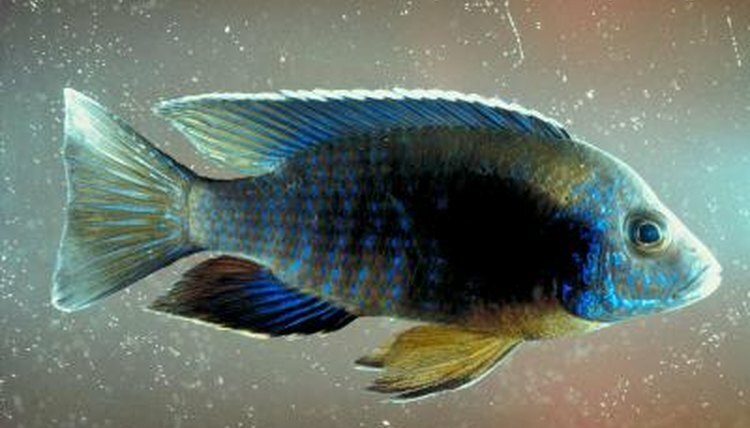 Malawai bloat is the first disease to consider if your cichlid is spending an unusual of time at the bottom of the tank. Other symptoms swollen stomach, abnormal breathing and white feces. Dirty water or improper feeding trigger the disease, which is caused by the proliferation of a protozoan naturally present in the fish's intestines. Change up to 50 percent of the water, add Metronidazole and remove carbon filters or your fish can die in 24 to 72 hours. The Cichlid Forum: Why African Cichlids? What Does It Mean When a Fish Swims Nose Down?